Life on the Grind: By the Numbers - PPTQs and You! 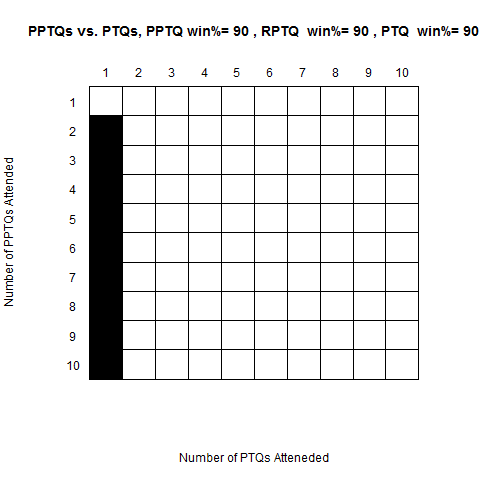 By the Numbers - PPTQs and You! 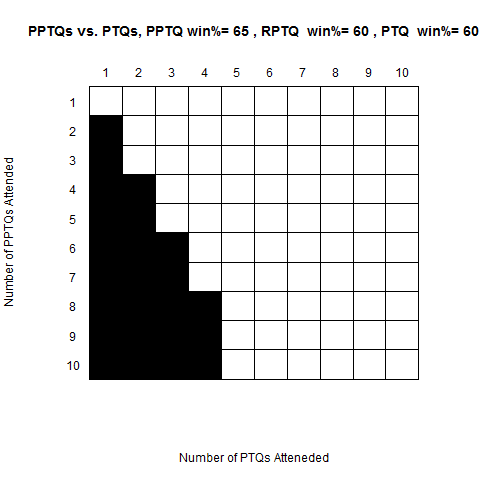 Now that we have attendance data available for the first round of PPTQs, I decided to finally run the numbers on the old system vs. the new one. 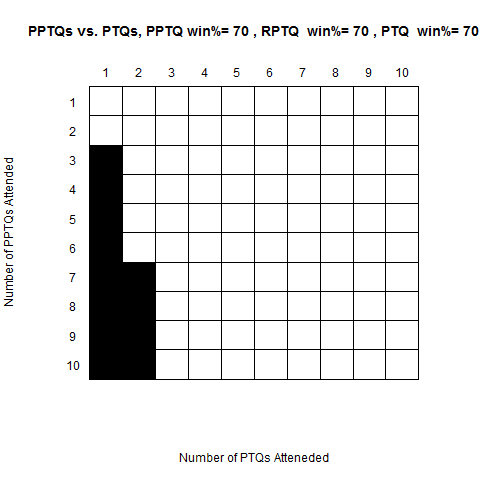 I think it's important for players to see how the newly implemented PTQ system impacts their chance of qualification and therefore decided to write up a little function to quantify that. You can find the function, grindNumber, and the script to generate the graphs presented below on the Github repo I made for this. 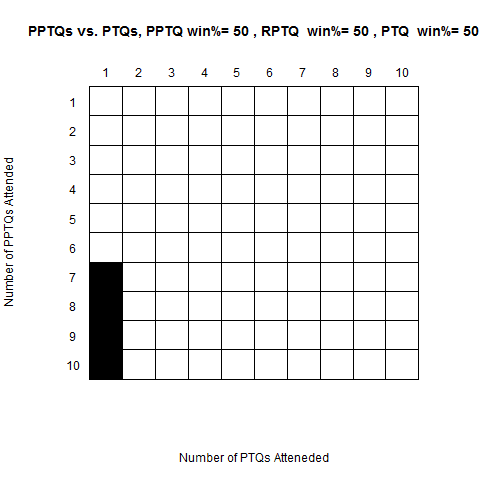 Based on the numbers gathered here, the average PPTQ looks to be around 6 rounds of magic with all X-0-2s and X-1-1s making it. 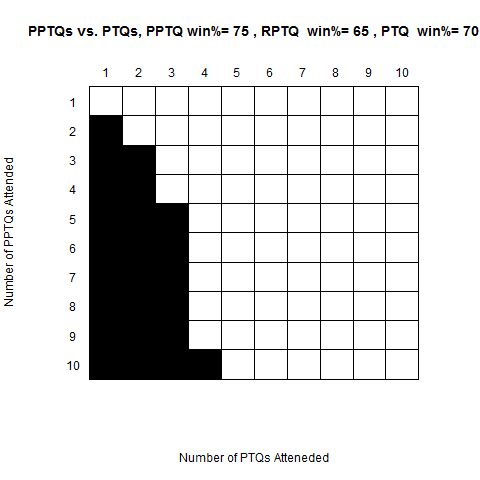 Based on projections on Reddit, the average Regional PTQ (RPTQ) has 74 players which would make it 7 rounds with all X-0-2s and X-1-1s making T8. 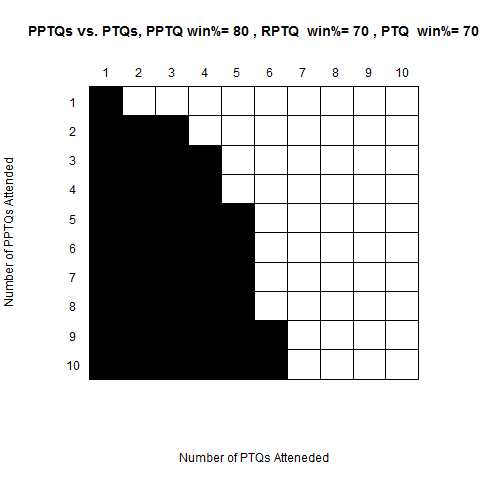 For the old PTQs, I assumed an event of 8 rounds with all X-0-2s and X-1-1s making the T8. You can change the number of expected rounds for the event by inputting the number of expected rounds into the r1 (for PPTQ), r2 (for RPTQ), r3 (for PTQ), or r4 (for GPs, but those are always 15). 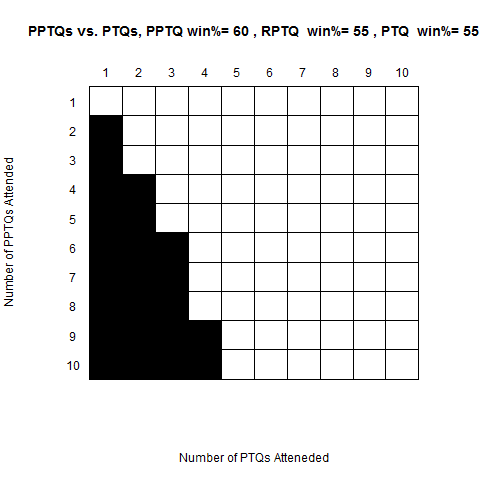 If you averaged 3 PTQs per season last year and can make it to 4 PPTQs this season, you go to (3, 4) [3 on the horizontal axis, 4 on the vertical] and if the box is black that means the new system is better for you. I think a good tl;dr takeaway from this is that this system rewards good players who aren't able to play in a large number of events, but hurts "grinders" who hit 4+ normal PTQs a season. I think this is overall a great change, so yay, :P.
Edit 2: If anyone wants particular numbers run, just post them in the comments and I'll produce the graph for you. Nice graphs, Chris. It's nice to have some "data" to back up claims about who the new system favors.